Minimize your risk, downtime and equipment failure with Cliff Industrial’s on-site hydraulic inspection and troubleshooting! If your system is down and oil is collecting around your feet, you’re losing money! You need to quickly identify which component has failed, fix it, test the system and get back to work. Our on-site hydraulic inspection service is designed to conveniently check the performance of hydraulic pumps, motors, valves and hydrostatic transmissions. Using digital hydraulic testers, we can accurately measure flow, pressure and temperature. 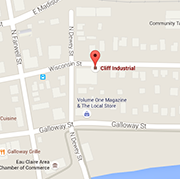 Cliff Industrial’s Hydraulic System Inspection services most types of hydraulic equipment in the field throughout Northern Wisconsin. Our on-site hydraulic inspection service includes visually and mechanically testing all critical hydraulic components such as hoses, pipes, and valves for cracking, worn fittings, temperature, pressure, and other damage that could allow fluid bypass to ensure hydraulic systems are properly transmitting power. We offer both regular services and 24/7 emergency assistance. Our trained technicians offer fast turnarounds of cylinder repairs of 1-2 days! All other hydraulic service needs, less than one week, dependent on part availability! During normal business hours, labor costs are starting $150 for field service. Cliff Industrial’s hydraulic technicians are prepared to provide quick, cost-effective, on-site hydraulic system inspections. Give us a call now!